Cascadia Of Nampa is a 52,000 square foot healthcare resort plaza designed with the community at the forefront of every decision. We are conveniently located less than a mile from the Nampa campus of St. Alphonsus Hospital. Cascadia of Nampa houses the only NeuroGym in Idaho. When our guests are working with therapy, they will enjoy private and semi-private suites that surround beautifully landscaped courtyards. 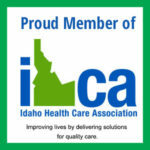 Get more information about Cascadia of Nampa’s full time nursing care facility. © 2019 Cascadia of Nampa.